Whilst these two announcements are just a start in terms of what is needed, they nonetheless mark a great step forward – hopefully a new recognition at the upper echelons of government that everyday cycle use is a means of transport which contributes widely to many government objectives, including transport, health and environment. But continued lobbying is vital – far more is needed to meet the government’s target of 10% of trips to be by bike in 2020, and indeed, under current plans, cycling investment starts to fall back again in 15/16. The 14/15 increase contrasts markedly with the Scottish Government’s attempts to cut cycling investment in its early years in power. The announcements are a huge credit to those who have pushed consistently for this recognition – see below. The draft budget published recently included £10m ‘extra’ for active travel investment in each of 14/15 and 15/16, but due to the obscurity of the budget it was not clear if some of this was just re-announcing existing money. In response to complaints by Green MSP Patrick Harvie, Finance Secretary John Swinney MSP provided a breakdown [pdf 1.5MB]. Whilst this breakdown itself is somewhat complex, Spokes can confirm that it is all money not previously announced. The 14/15 announcement marks a most welcome 50% rise in cycling investment from its 13/14 low level – but the total is still nothing like what is needed to give any hope of the government meeting its own target for 10% of all journeys to be by bike in 2020, as calculated in our CAPS submission earlier this year. The picture beyond 14/15 is the opposite of what is needed. If the government is serious about growing everyday cycle use substantially it should be ramping up investment, building expertise and experience in every Scottish Council. Meanwhile huge sums have been promised for road programmes – the costliest so far being £3000m to dual the A96 and £3000m to dual the A9 – and probably resulting in a transfer from rail to road [see Transform and SAPT]. 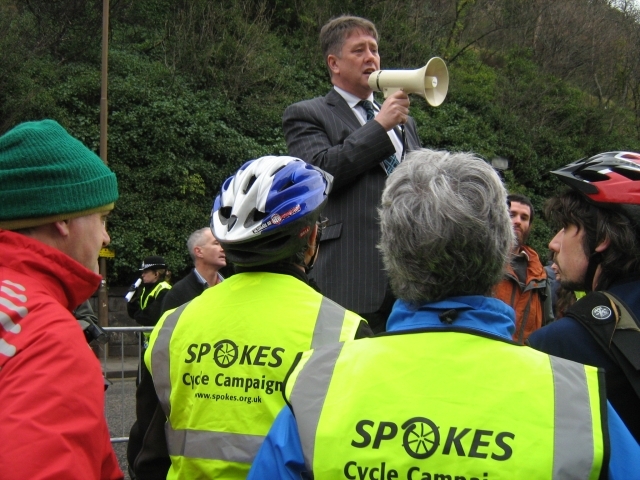 Spokes supports the campaign by Stop Climate Chaos Scotland to double active travel investment from its mere 1% of total transport spending in 13/14 to 2% in 14/15 (i.e. £40m) and to build beyond that to 10% by 2020. Please follow the above link to the SCCS campaign, enter your postcode, and use it to email your MSPs. Also put the date Weds 30 October (1pm) in your diary – more info later!! Transport Minister Keith Brown MSP has announced how the £20m will be used – first, to boost cycling investment throughout Scotland, via Sustrans’s work with Councils and others, and, second, to deliver some substantial ‘exemplar’ projects, of which the first will be Edinburgh’s Leith Walk. The Council will receive up to £3.6m so that the long-promised Leith Walk revamp will not just be a question of a new surface, but will provide an “exemplar corridor” for walking and cycling. Massive lobbying and other community involvement has gone into persuading the council to do something really good on Leith Walk. Here is an early circular to local Spokes members over 18 months ago [pdf 100k]. Here is a recent submission [pdf 188k]. And here are some of the intermediate stages! Campaigning on Leith Walk has been superbly led throughout by Greener Leith with one of the most effective submissions of the campaign jointly developed with a wide range of community organisations, with Spokes providing major input to its cycling elements. The current Leith Walk plans [July, see entry 1307 here] are still not all we would like – see our submission at the above link – but are a huge improvement, and are still evolving in response to feedback. But these new plans could only go ahead with substantial additional money – cash which is now on the table thanks to today’s announcement. The outcome is a combined result of local lobbying about Leith Walk as well as national lobbying about cycling investment in general – both were essential, though no one knew they would come together like this – another example of how local and national lobbying feed on each other. Greener Leith says the new plans and the new money show what can happen when civic society works together to achieve a common goal, and that whatever happens now Leith Walk will be safer and more attractive for pedestrians and cyclists. They (and we) look forward to working with the council to improve the current design proposals further to make sure that they a worthy national exemplar. Here is Edinburgh Council’s press release on the new Leith Walk funding. Spokes and Spokes members for consistent lobbying of MSPs and councillors. Edinburgh Southern MSP Jim Eadie received over 100 emails from concerned constituents when the government proposed cycling investment cuts in its draft 2012/13 budget. Lobbying has been backed up by well-researched submissions to government and councils. Other environmental/ transport organisations such as Transform Scotland and Stop Climate Chaos Scotland for submissions, lobbying and campaigns, such as the January 2012 St Andrews House demo. The amazing demos in 2012 and 2013 by Pedal on Parliament followed up by lobbying of MSPs and Ministers. Concerned MSPs It is vital for concerned members of the public to contact your own MSPs, not just those considered as ‘friends,’ so that there is widespread understanding of and support for cycling investment. However we particularly credit Jim Eadie MSP and Alison Johnstone MSP who have put huge effort into making the case. Jim, despite being a government MSP, has frequently and publicly questioned his own Ministers and made the case behind the scenes. Alison instigated the Parliament’s first ever debate on cycling and jointly with Jim set up the Parliament’s Cross-Party Cycling Group. City of Edinburgh Council The Council’s decision to allocate 5% of its transport budgets (capital and revenue) to cycling investment (and increasing by 1% a year) has set a real challenge to government as well as to other councils across Scotland. The government does not like to be asked why it only invests 1% of its transport budget in cycling when Edinburgh allocates 5% – and increasing year on year.